\nBorgo Panigale (Bologna, Italy), 28 January 2019 – The Ducati MIG-RR, the new E-MTB first presented by the Bologna-based motorcycle manufacturer at EICMA 2018 last November, is now arriving in dealerships. 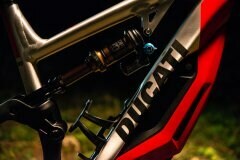 As of 25th January the pedal-assist mountain bike - the result of close teamwork by Ducati and Thok Ebikes - can be ordered directly from www.ducati.com (go to the dedicated MIG-RR area) or from the Europe-wide Ducati dealership network. \nThe MIG-RR proved to be an immediate hit as soon as photos of it were released in the run-up to EICMA 2018 where the MIG-RR made its public debut. 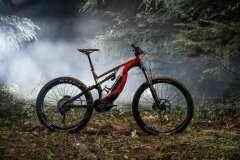 \nThe MIG-RR is an enduro E-MTB with 170 mm of wheel travel at the front and 160 mm at the rear. 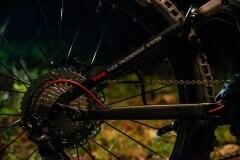 It mounts top-drawer components such as the Shimano Steps E8000 motor with 504Wh battery, FOX Factory Kashima suspension, 4-caliper Shimano Saint brakes, Mavic wheels (29” front, 27.5” rear), carbon fibre Renthal handlebars and a livery specially developed by D-Perf, owned by Aldo Drudi. 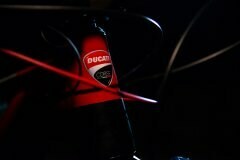 \nThe new Ducati pedal-assist mountain bike can already be ordered and deliveries are expected to begin in April via the official Ducati dealership network or directly to customers\' homes. 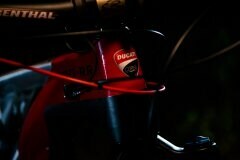 Borgo Panigale (Bologna, Italy), 28 January 2019 – The Ducati MIG-RR, the new E-MTB first presented by the Bologna-based motorcycle manufacturer at EICMA 2018 last November, is now arriving in dealerships. 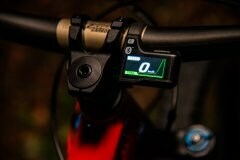 As of 25th January the pedal-assist mountain bike - the result of close teamwork by Ducati and Thok Ebikes - can be ordered directly from www.ducati.com (go to the dedicated MIG-RR area) or from the Europe-wide Ducati dealership network. The MIG-RR proved to be an immediate hit as soon as photos of it were released in the run-up to EICMA 2018 where the MIG-RR made its public debut. 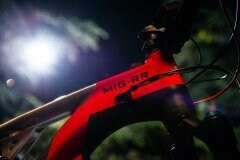 The MIG-RR is an enduro E-MTB with 170 mm of wheel travel at the front and 160 mm at the rear. 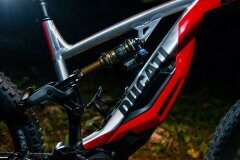 It mounts top-drawer components such as the Shimano Steps E8000 motor with 504Wh battery, FOX Factory Kashima suspension, 4-caliper Shimano Saint brakes, Mavic wheels (29” front, 27.5” rear), carbon fibre Renthal handlebars and a livery specially developed by D-Perf, owned by Aldo Drudi. 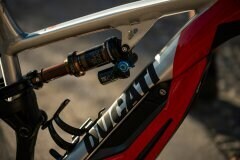 The new Ducati pedal-assist mountain bike can already be ordered and deliveries are expected to begin in April via the official Ducati dealership network or directly to customers' homes.